The life of a reader is a private one. Reading a book, whether an e-book, mass-market paperback, or vellum-bound incunable, creates an incontrovertible connection between you and its creator. Regardless of how many readers may experience the same book, this connection doesn’t break: even the most boisterous of book clubs is nothing more than a public airing of private interpretations. We sometimes seek these outer, tangential connections, desiring affirmation of opinions or challenges from almost-like-minded souls, sharing notes to better enrich that intimate contract between reader and writer. Sometimes, these notes are little more than a shout in the dark, a scribble in the margin, waiting to be found by another reader elsewhere in time. 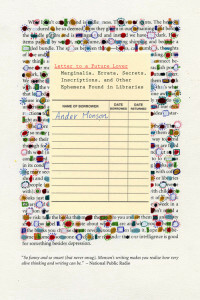 Ander Monson is a kindred spirit, a fellow traveler, a journeyman as committed to the quiet life of literary enrichment as you yourself may be. Placing your hands in his margins transports you into the best of company and connects you with a writer aware of the deeper motivations behind why we read, and how that ritual might inform who we are and how we grew to become that person. Monson, curiously, has us as his readers but wants to connect with us as peers, acquaintances. He understands the intimacy between a reader and writer, and, minds bared, sees us as lovers of a certain sort. Monson keenly observes that we change who we are as readers throughout time. A freshmen literature major, for instance, will have a wildly different experience reading a classic as a late teenager than he will as a father, a generation later. But, could those two timelines converge and converse? Could they maybe learn something from one another? In Letter to a Future Lover, Monson investigates this possibility. He rummages through stacks of wayward libraries for potent marginalia, and in a series of short essays attempts to record these ephemeral communications, to pull from the ether a connectivity that might make the life of reading a little less lonesome. “Treating a library as a crematorium for yesterday’s knowledge does no one any good,” Monson writes in an essay called “Bind in Everything”. “This place breathes, expands, contracts with cold and breath, the infusion of new words.” A library could be a beacon for the future, a hub of lost communication or communication that’s yet to happen, a place of lonely, potent ideas bouncing around like numbers stations from book to book and reader to reader. Books should not be present-day distractions but waypoints to the future, bound invitations to learn and grow and reflect. 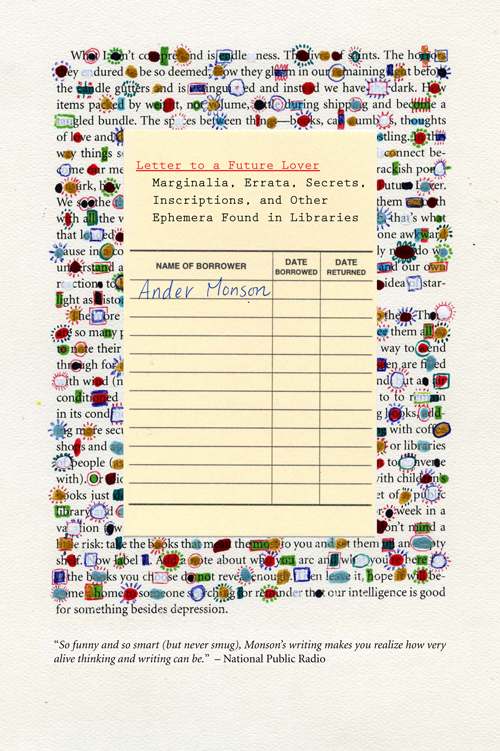 Letter to A Future Lover is exactly the kind of book Monson yearns to be archived in our collective library, the book we need to shine the way. It is a masterpiece and one that every passionate reader should experience.